just as a story unfolds in the process of narration? Two performative, public walks (1) and printed matter (2) initiated by Yeb Wiersma in collaboration with author Miek Zwamborn and hosted by Green Art Lab Alliance, Jan van Eyck Academie, Kunsthuis SYB and Louwrien Wijers. Graphics: Dongyoung Lee. Walk 1: Friesland, mudflats. Walk 2: South Limburg, limestone forests. To experiment with a form that unsticks, like in walking the script is constantly moving. With Rob Schmutzler (mudflat guide), Louwrien Wijers (artist) and Egon Hanfstingl (Buddhist chef) in Ferwert, Netherlands, Spring 2015. Wiersma approached artist Louwrien Wijers, who lives in Ferwert to react on the idea of ‘Walking as Sculpture‘, this in relation to Wijers her former series of interviews with Joseph Beuys1 in which they discussed the concept of ‘Writing as Sculpture’ as part of her body of work. This lead to a conversation and walk associating on the physical and mental impact of moving through an open, tidal landscape – muddy trails come and go due to the gravitational forces of the Sun and the Moon – and how it destabilizes your sense of solid ground and how we have to begin to learn to live with groundlessness2, according to Wijers. Author Anne Marijn Voorhorst walked along and wrote a text reflecting on her experience;3. 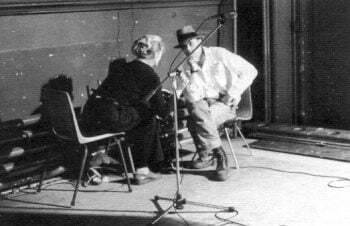 Louwrien Wijers in conversation with Joseph Beuys. “I’d rather slog through mud than indifference.” – Quote Fragment by Francis Ponge from ‘Unfinished Ode to the Mud’, one of the references along the walk. 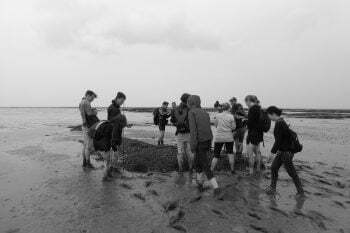 While researching the area Zwamborn and Wiersma collected dozens of local words taken from the specific landscape, like ‘Prielen’, the word for temporary trail that occurs during low tide. 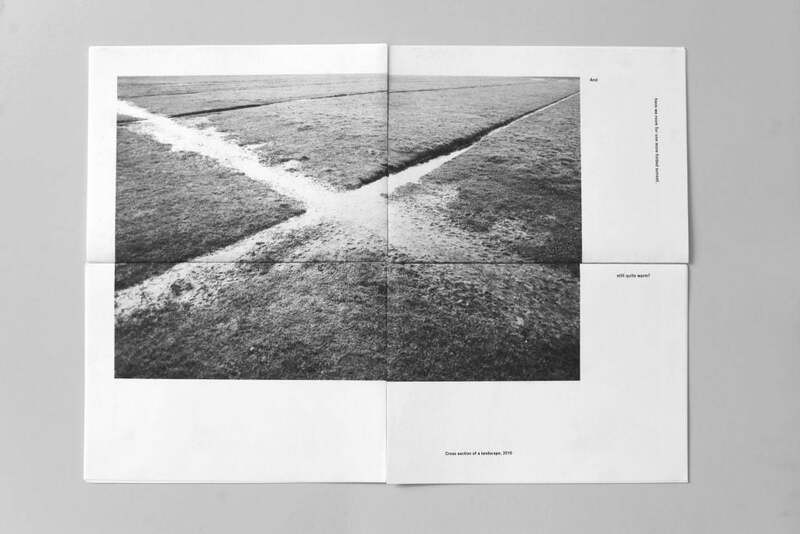 Image: RISO poster, folded horizon, mudflats of Dantziggat, 2015 (Image Yeb Wiersma). 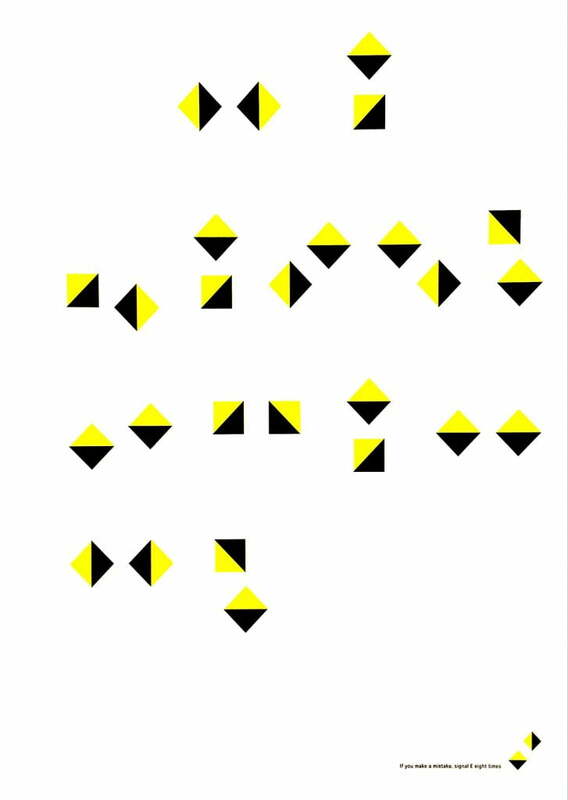 RISO poster (A2) displaying the text ‘no solid ground’ in semaphore, maritime alphabet.